” Awakening” eBook was published in 2015 and was written by Adair Hart (http://www.adairhart.com). Mr. Hart has published two novels, this being the first in the “Evaran Chronicles”. I received a galley of this novel for review through https://www.netgalley.com. I categorize this novel as ‘R’ because it contains scenes of Violence and Mature Language. This Science Fiction novel is set in the contemporary USA. An alien vessel has been visiting various planets and abducting a few representatives from each. The abductees are then kept in simulations and studied by the aliens. Dr. Albert Snowden and his niece, Emily are among the for abducted from Earth. They are rescued by a mysterious alien, Evaran. Snowden and the other Earthlings follow Evaran as they make their way through the large alien space craft. Damage to the vessel has left it only partially operable, with predators from many planets roaming freely. Evaran, and his party, must fight their way past many different predators. To make matters worse, a group of mercenaries have boarded the vessel and are trying to catch or kill them. 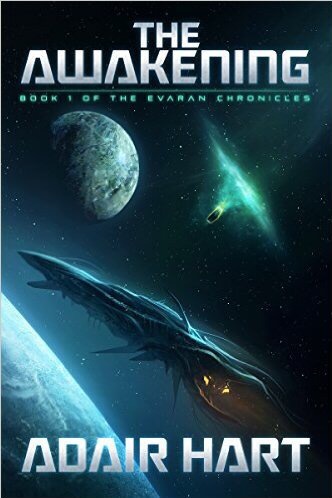 Only through their ingenuity and the wonderous technology Evaran has are they able to survive. I liked this 190 page Science Fiction story and enjoyed the 3.5 hours I spent with it. While it wrapped up the story line for this novel, there is certainly opportunity for a continuation with these characters. You learn some of the Evaran character, but there is still much of a mystery around him. I give this novel a 4.5 (rounded up to a 5) out of 5.